The Database Enhancement Gateway, which allows repairers and insurers to make inquiries and suggestions of the estimating providers at no cost, offers weekly tips for repairers on the Audatex, Mitchell and CCC programs online and through the Society of Collision Repair Specialists’ email list. Here’s our latest monthly roundup of areas spotlighted as tip-worthy by the DEG. To receive the tips as soon as DEG releases them, like/follow the DEG’s Facebook and Twitter feeds. (It also posts videos to a YouTube channel once in a while.) Or just browse the more than 13,000 inquiries and responses in the database and see what else you learn. 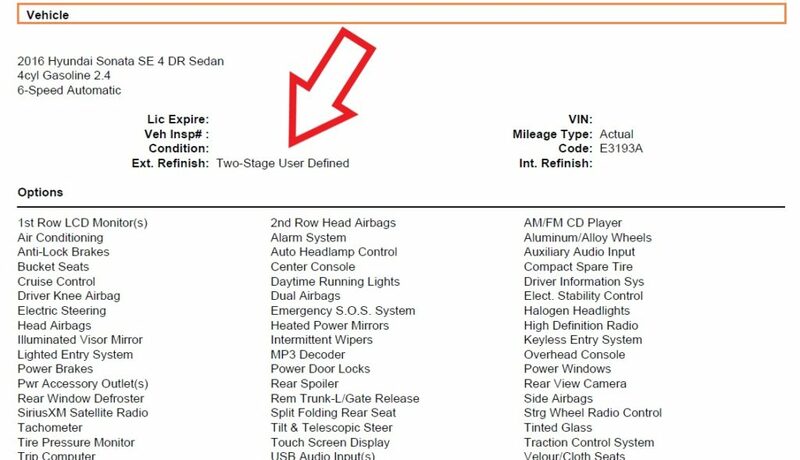 This isn’t a formal Database Enhancement Gateway tip per se, but we felt we’d use one of the slots to remind readers they have a great opportunity to snag a free year of Toyota’s Technical Information System (TIS). The Database Enhancement Gateway and Toyota will give one of the DEG’s March users or donors a chance to win a standard subscription to the official Toyota repair procedure website. Each inquiry submitted to the DEG between March 1-31 meeting certain criteria would earn the user a ticket in the drawing to win the year of TIS — which ordinarily costs $480. Users submitting multiple entries can earn multiple tickets. Repairers and insurers also can enter the drawing by donating to the DEG. A donation of $20 yields two tickets, while a $50 donation provides 10 tickets. There is no limit on entries. The drawing will be held April 1 at 10 a.m. Mountain Time. The DEG allows repairers and insurers to submit online inquiries and suggestions regarding Audatex, CCC and Mitchell methodology and labor times at no cost. The inquiries can help catch inaccuracies or omissions in the times and refine the information used to generate estimates. They also can help clarify who’s right when repairers and insurers dispute what’s included and what’s a manual entry. More than 13,000 inquiries have been submitted to date, with a mere handful yet to be resolved by the IPs or DEG. Inquiries and answers remain in the database, providing a great educational resource to other parties besides the user. Inquiry submitted for any of the three IP’s (CCC, Audatex, Mitchell) to help improve the quality and accuracy of collision repair estimate data. Inquiries will need to meet the following guidelines: Omissions, errors, inaccuracies found in the databases. This would include Labor Issues, Parts database issues, vehicle specific inquiries. Inquiries not meeting the criteria above, will not be eligible for raffle submission, but will still be responded too. If an inquiry is questionable, the DEG Joint operating committee will review for final decision. Audatex’s P-Pages report that high-build primer was a not-included procedure within its refinish times, the DEG pointed out in a tip tweeted Feb. 25. “If a welded replacement panel requires the use of such product and material, labor to apply ‘High Build’ Primer is NOT included and would be an on the spot evaluation for the labor and materials used,” the DEG’s tip states. Labor to block sand the “High Build” primer in “the seamed areas, to bring the panels to the condition of a new, undamaged panel for the purpose of refinish” would be included in the panel replacement time. Audatex also notes in a Database Reference Manual passage related to corrosion protection that high-build primer isn’t included in replacement work either. Audatex does not include allowances for the restoration of bare metal or application of an “e-coat” equivalent or a “high build primer” either in refinish or in replacement labor. The DEG offered a couple other refinish tips as well alongside the high-build primer lesson. It reminded repairers and insurers that second and third masking and bagging/covering operations aren’t included in labor times. “As always, material cost is never included in Audatex Labor Guides,” the DEG also wrote. The DEG in a tip tweeted earlier this month said Audatex Estimating’s 8.06 version offers users another option related to exterior paint settings. “Prior to Audatex Estimating 8.06, AudaVIN color decoding would override the default single / two stage exterior setting from the Admin module,” the DEG wrote. “This behavior is still the default as AudaVIN properly decodes single / two / three stage color when option color information is received from the manufacturer. 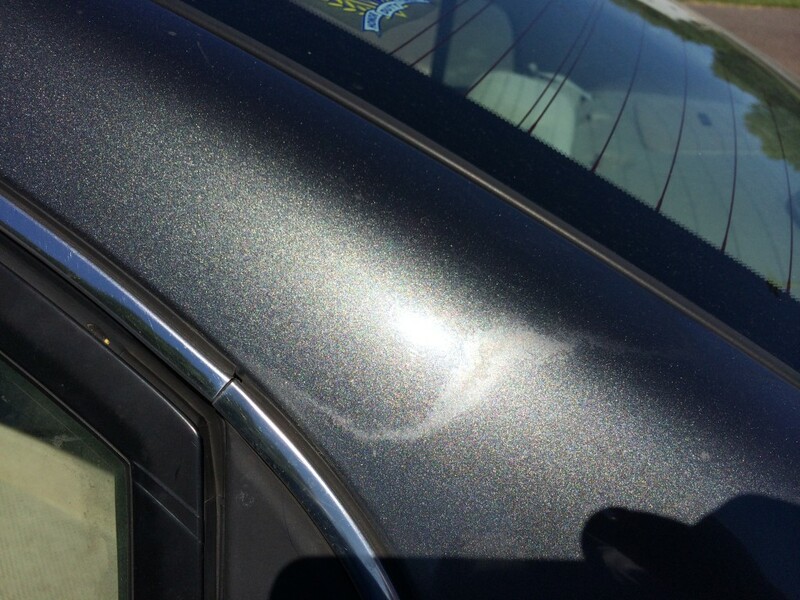 The paint profile can be seen by consulting the “Ext. Refinish” line in the vehicle section of the system, according to the DEG. Virtually every major paint manufacturer demands auto body shops extend the clear to the natural breaking point of the panel to qualify for a warranty. 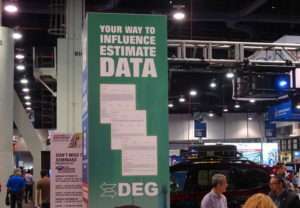 The DEG this month provided a cheat sheet matrix for how estimators should address this. Essentially, very little related to the work is included by default. 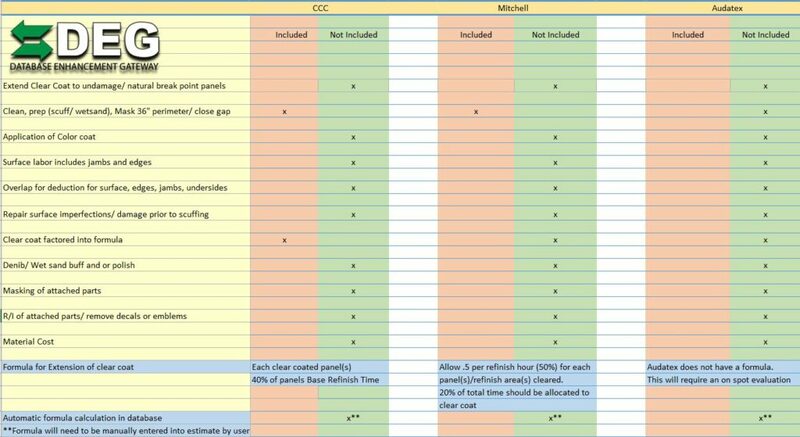 CCC and Mitchell do include the work to clean, prepare (wet-sanding or scuffing) and mask a 36-inch perimeter/”close gap,” according to the DEG. CCC also factors clear coat into its formula, the DEG wrote. However, none of the estimating services include the extension of the clear coat to the break point. Nor do they automatically calculate a formula for doing so, though CCC and Mitchell do at least have such a formula you can use to obtain time to manually enter. According to the DEG, Mitchell’s formula is 50 percent of the refinish time for every cleared panel, with 20 percent of the total time given to clear. CCC opts for 40 percent of the base refinish time for every panel, the DEG indicates. Audatex, as mentioned above, doesn’t have a formula; you’ll have to determine a value yourself, according to the DEG. The three estimating services also vary when it comes to what bonded glass-related operations are and aren’t included. Fortunately, the DEG provided another cheat sheet to help you keep track of it all. All three include installing glass on a bolt-on or welded replacement part in their times. 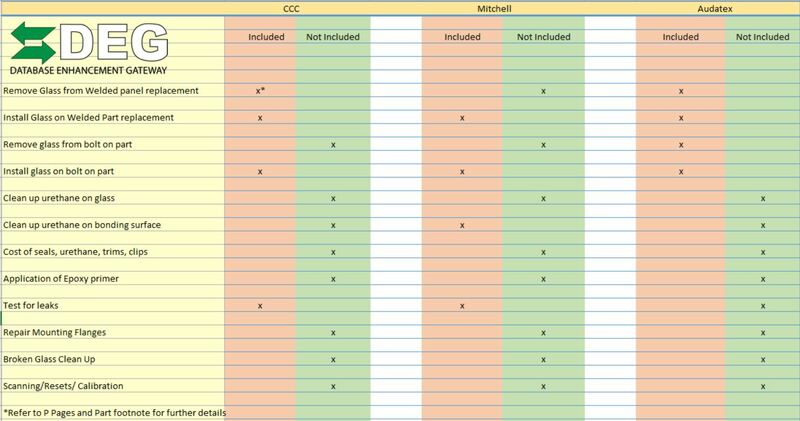 However, only CCC and Mitchell include leak testing, and only CCC and Audatex view removing glass from a welded panel replacement as included — and the DEG qualified its CCC guidance here with a directive to refer to part footnotes and P-pages. Mitchell is the only one to include cleaning up urethane on the bonding surface. “Always refer to OEM repair instructions for correct supplies required to install as per OEM documentation,” the DEG wrote.